One of the most frequent questions we have been asked lately is, "What's the best single auger juicer? There are so many." 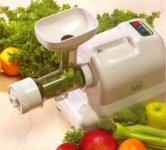 When the single auger style juicer came out just a few years ago, there was only once choice; It was the Oscar Juicer (which is basically the same as the Omega 8001 that came out soon after). Then came the Samson, which was an improved design of the Oscar, and then the Lequip Visor with its off-set feed chute and smaller screen hole size than the Omega 8001 or Samson. All these units are about the same, aside from minor differences in design - they each have one juicing screen (all about the same size) and an auger that is about the same size. 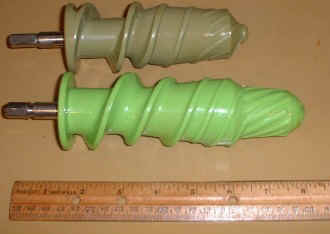 Now, Tribest (the company that brought you the Green Power and Green Star Juicer) enters the single auger juicer market. The new Solo Star Juicer has the standard juicing auger, but it is shaped a bit differently than the others. Please see photo (Visor Auger is on top, Solo Star auger is on bottom). The Solo Star auger is about two inches longer. Due to this design change, the juicer also has two juicing screens, which the manufacturer claims lead to a higher yield of juice. We will test this claim, so read on. . .
Before getting to the tests, lets take a look at the construction of the two machines. The Lequip Visor has a more sleek look with round corners. The "visor" flips over to the other side of the juicer when the juicing apparatus is not attached. It then is reminiscent of a Volkswagen "bug". The Solo Star is more boxy and square in design. It is also a fair bit longer, due to the long housing that contains the juicing auger. The Lequip Visor has the "standard single auger set-up"- similar to the Omega 8001 and Samson Juicer. It has a single auger that crushes the produce and pushes it (crushed produce and juice) into the screen, at which point the juice is pushed through the screen and drips into the collection bowl. The Solo Star design adds an extra step to the standard single auger set up. After the Solo Star initially crushes the produce, any "thrown" off juice immediately drips into the collection bowl, and then the produce is pushed into the screen for further juice extraction. Does this extra step really add to the quantity of the juice produced? We did a direct comparison with the juicing of Cal-Organic Carrots. We carefully measured 2 pounds, 12.5 ounces of carrots for each juicer and fed them through. You can see the results of the test in the table below. As you can see from the table above, the Solo Star produced 26% more juice when juicing carrots in our test. Of course, results will vary depending on the produce being juiced. Remember that loss of yield means that you are throwing extra "juice" away in the fiber! I tasted the juice, and the juice was not as "fiber free" as a centrifugal ejection machine or twin gear machine. The juice did have less pulp than the other single auger juicers I have tested (Samson and Omega 8001). The Solo Star juice seemed to have less tiny bits of pulp than the Juice created by the Visor. Again you can see that the difference is 24%, which would lead us to believe that the Solo Star Juicer is more efficient, since it does extract the juice out of the fiber of the carrot. We also might mention that after looking at the carrot pulp, it looked like the Solo Star did a better job of breaking down the carrot fibers, since I saw smaller pieces of pulp than was created by the Lequip Visor. After weighing the pulp we wanted to see if we could extract more juice out of it, so we fed the pulp back through the juicers again to see how much more juice we could get. This is where things got a bit complicated. It's always harder to juice pulp than juicing whole carrots in single auger juicers. We had to press the pulp into the machines with a fair bit of pressure to make the pulp feed through the machines. When we did it on the Lequip Visor everything went as planned, the pulp came out a bit dryer, and it produced an extra 4.5 ounces of juice. Even with the extra 4.5 ounces, the yield of the Lequip Visor was less than the Solo Star. If you did want to get a second pressing, we would recommend the Ito hand press. You can read another article I wrote entitled, "Are you getting all the juice?" Juice Quality- The Solo Star runs at a lower 80 rpm, and seemed to produce a "finer" juice with less pulp in the juice. Clean up- The Solo Star has a smaller main juicing screen, which has less surface area to clean. The other juicing screen was built into the housing, and was easily washed with my kitchen sprayer. Pulp Collection - The Lequip Visor pulp collection bin is larger (40 ounces) and was much easier to line with a plastic bag, thus easing cleanup. The collector on the Solo Star is only 32 ounces. Juice Collection - The Lequip Visor juice collection bin is smaller (20 ounces) and does not hold as much juice as the Solo Star collection bin that holds 32 ounces. Ease of Use - Feeding the carrots into the Lequip Visor was a fair bit easier due to the off set feeding chute that helps to pull produce into the machine. When feeding carrots into the Solo Star, they had to be pushed with some constant downward pressure. Noise Level - Both juicers are both on the quiet end of the juice spectrum; the Solo Star was quieter in our decibel test. 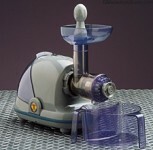 Warranty - The Lequip Visor juicer warranty is 6 years, while the Solo Star juicer is 5 years. Size of Feed Tube 1.50" x 1.50" 1.50" x 1.50"
We prefer the Lequip Visor over the Samson and Omega 8001 due to the offset feeding chute, and smaller screen hole size. It's the smallest and most compact single auger juicer. Better for juicing when you want a "Second Pressing"
Please note: These are our tests and our opinions, your results may vary.